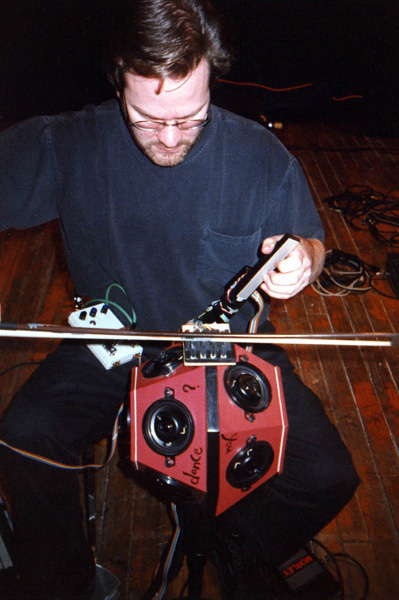 Traditional musical instruments provide compelling metaphors for human-computer interfacing, both in terms of input (physical, gestural performance activities) and output (sound diffusion). The violin, one of the most refined and expressive of traditional instruments, combines a peculiar physical interface with a rich signal processing acoustic diffuser. We (Dan Trueman and Perry Cook) have built a new instrument that includes elements of both the violin's physical performance interface and its spatial filtering audio diffusor, yet eliminates both the resonating body and the strings. The instrument, BoSSA (Bowed-Sensor-Speaker-Array), is an amalgamation and extension of our previous work with violin interfaces, physical models, and directional tonal radiation studies. In addition to describing (see our paper)** the various physical and software elements that make up BoSSA, we discuss some of its musical features and potentials; we are particularly impressed by the sense of presence and intimacy it provides, and by its potential for creating a new kind of electronic chamber music. see a diagram of the original BoSSA, and two other images of the instrument: 1, 2. **this paper was awarded the Swets and Zeitlinger Distinguished Paper Award at the 1999 International Computer Music Conference in Beijing, China. watch Quicktime video of the Lobster Quadrille, in a recent performance. also, Vocalise, a new tune for BoSSA, where my own voice gets processed through BoSSA. with shakuhachi'ist Tomie Hahn, at the New Interfaces for Musical Expression Conference 2005 (small, large). with the accordianist Alan Bern (link), at the College-Conservatory of Music in Cincinnati. check out RECORDING FIELD, H, a DVD of improvisations with interface and Pauline Oliveros; BoSSA is featured on the title track, with Tomie Hahn playing shakuhachi "tethered" to BoSSA.